The deadline to file income taxes is midnight Monday April 15. Tax preparers recommend filing for a six-month extension if the taxpayer can’t file on time or, if a substantial amount of tax is owed, to file their return and request a 120-day extension on making payment. “The good Lord giveth and Uncle Sam taketh away” is how folk singer Pokey Lafarge put it, and with the deadline to file federal income taxes looming, the Internal Revenue Service says it has seen a decline in people filing early and estimated nearly one in 10 filers will request an extension. 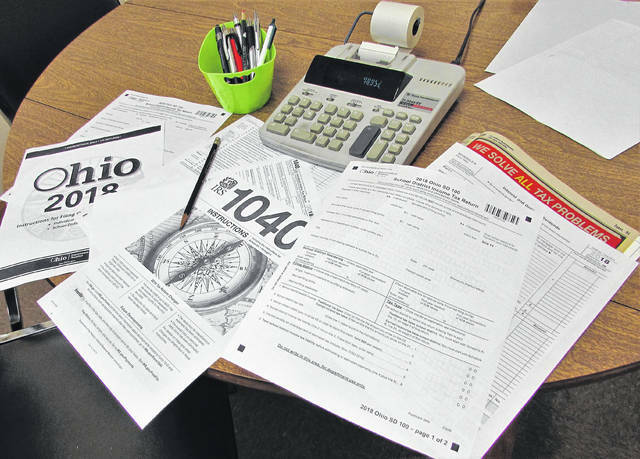 The deadline to file is midnight Monday, April 15, and for those feeling overwhelmed, tax professionals like Kelly Dye at American Way Tax and Accounting in Hillsboro say to just take a deep breath and get the necessary paperwork together. She said if a person intends to itemize, they would need to bring in documentation proving eligible deductions such as medical bills, real estate taxes, charitable donations, mortgage interest, and state and local taxes withheld as shown on their W-2s. There have been many changes in the tax laws since last year, according to Jackie Massey of H & R Block in Greenfield, such as an increase in the standard deduction for married couples filing a joint return to $24,400, and for individuals or those married filing separately the deduction is $12,200. Another big change was the elimination of form 1095, which taxpayers had to use to prove they had health insurance as part of the Affordable Care Act, or “ObamaCare,” but beginning in 2019, the Trump-led Tax Cuts and Jobs Act repealed the individual mandate, which means taxpayers won’t be required to file the form with next year’s return. Dye said that about 95 percent of her company’s clients aren’t able to itemize their taxes because they don’t have enough deductions to exceed the increased standard deduction. Though there are some who will procrastinate because they owe the government money, Massey said they should go ahead and file their tax return. Charles Colliver, lead clerk at the Hillsboro Post Office, advised against an 11th hour attempt at dropping off a return, since with the office closing at 5 p.m. Monday, anything mailed after that time will have an April 16 postmark. The worst thing any taxpayer can do is to “blow it off” and walk away from filing a tax return, Massey said. She said that at this late day of the tax year, beware of scam artists who will prey on taxpayer insecurity and panic, and that in her estimation 98.9 percent of phone calls received by taxpayers are scams. She advised to never give out any personal information, no matter how threatening or legitimate a caller may sound.